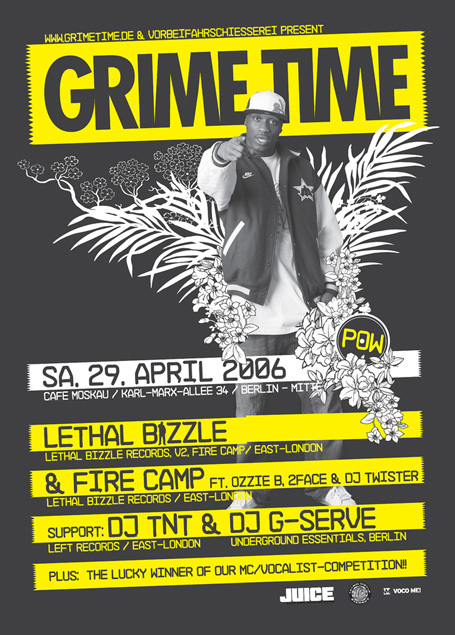 GrimeTime returns to Café Moskau this weekend with one of the biggest acts in the grime game as its headliner. Lethal B. 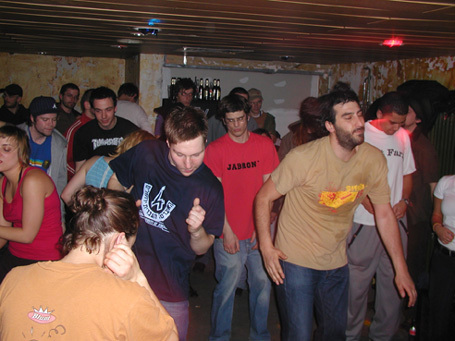 (or Bizzle, as he likes to be called nowadays) is responsible for the commercially most successful, but also most controversial recording in the history of the genre: „Pow!“ not only hit the UK’s Top 20, but also got banned from numerous clubs and radio stations because of its „gun lyrics“. The violent content of the song may have been taken too literally by some people, but one thing is for sure: The Lethal one doesn’t shy away from any battle. Talking about competition: GrimeTime had its own little battle for mic supremacy going on on their website during the past weeks. Aspiring MCs were asked to send in their own tracks, as the best performance would be awarded with a supporting slot at a GrimeTime show. This resulted in a fierce, but entertaining discussion on GrimeTime’s comment pages. Facing a load of promising contributions the crew must have had helluva difficult time with choosing a winner and finally decided that four finalists (Halbgott, Die i.D, Killa K, MC Ko & Mickey and Sookee) will be able present their tunes live on stage.